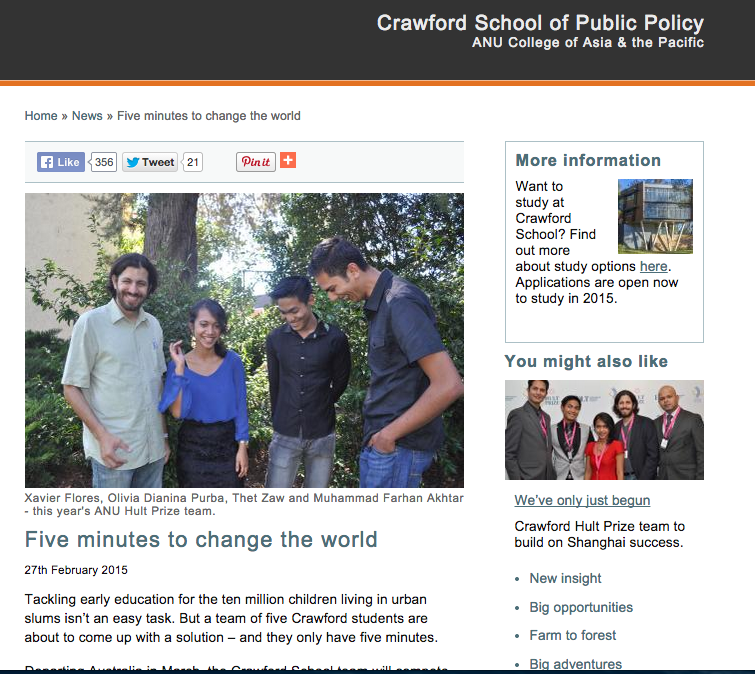 It is just been my eight month studying in Crawford, and I am incredibly proud to represent my school to the Hult Prize Competition in Shanghai few weeks ago. It was not an easy task juggling with assignments, extracurricular activities, and preparing business idea for the competition at the same time. In addition to an endless discussion to get contextual idea for the project ripped, I also needed to work the preparation of administration, financial, networking, publication and working with teammates who are really different in personality. It was not that smooth, I have to admit. Yet it was worth it! The initial reason why I wanted to join the competition is because I really enjoyed one of the courses I took last year convened by Paul D’Arcy. Passionate about the competition, Paul then delicately pursued me to join the competition which I though was worth trying. So after recruiting the team members, we submitted the application and successfully passed the regional competition phase, beating 20.000 applicants globally. As I said earlier the preparation was not easy, especially since most of the team members was not in Canberra during December 2014- January 2015. Me myself was in Vietnam for 2 weeks and in Kathmandu for 6 weeks doing some jobs. Even until the last minutes prior to flying to Shanghai, we still needed to discuss from FB, WA, Skype and Email (thanks to modern technology). Long short story, we did not come as the only one team who will go to New York to compete for winning $1M for project implementation with other regional competitor winners. However, the experience was worth the effort. We managed to networks with business personalities and amazing students from prestigious universities around the world, understand entrepreneurship project more contextually and of course taste a bit of Shanghai’s beautiful megalopolitan city atmosphere (as well as its well-recognized haze pollution). Anyway, it is not finished yet. I am still on my way expanding my wings to give the best for the rest of 1.4 months of my stay in Australia. And everyday I learn new things from classes, people who I met in different occasions and the lovely community in Toad (student accommodation where I live at the moment).